Be the first to share your favorite memory, photo or story of Kimber. This memorial page is dedicated for family, friends and future generations to celebrate the life of their loved one. Kimber E. Johnson, 62, of Sheboygan, passed away Tuesday, April 3, 2019, at Aurora Sheboygan Memorial Medical Center. Kimber was born May 31, 1956, in Marshfield, to the late Kenneth and Elene Loomis. She graduated from Marshfield High School. 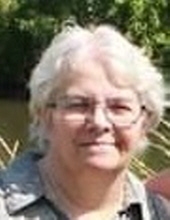 Kimber was employed by Rexnord Plastics in Grafton for over 35 years. She loved spending time with her animals and enjoyed painting. Survivors include her husband, Gerald Johnson; four children, Sean (Jacki) Johnson, Kara Ramirez, Leia Johnson and Jeremiah Johnson; five grandchildren, Taylor Johnson, Katelyn Johnson, Cassidy Johnson, Brayden Ramirez and Laycie Ramirez; one sister, Kendra (Richard) Wadell and one brother, David (Liz) Loomis. In addition to her parents, she was preceded in death by one brother, Stephen Loomis. The family would like to extend a special thank you to the staff of Aurora Sheboygan Memorial Medical Center and Aurora at Home Hospice. To send flowers or a remembrance gift to the family of Kimber E. Johnson, please visit our Tribute Store. "Email Address" would like to share the life celebration of Kimber E. Johnson. Click on the "link" to go to share a favorite memory or leave a condolence message for the family.